Beginning today, Finding Harmony Blog will feature five guest posts all week as excerpts from a just released book, Fifty Shades of Grace: Stories of Inspiration and Promise, published by Herald Press (April 17, 2013). I served as compiler/editor for the book and wrote about that process on Mennobytes blog. Today’s story is by Michelle Sinclair; her bio appears below. She also is my daughter but don’t hold that against her. Cold mountaintop wind roared in my ears. The path through the snow had vanished, along with visibility beyond forty feet. I had no map, no compass, and no idea where the two-thousand foot cliffs I was supposed to be avoiding were lurking. My sister Doreen had gone to Scotland for her study abroad experience and I went to visit her on her spring break. 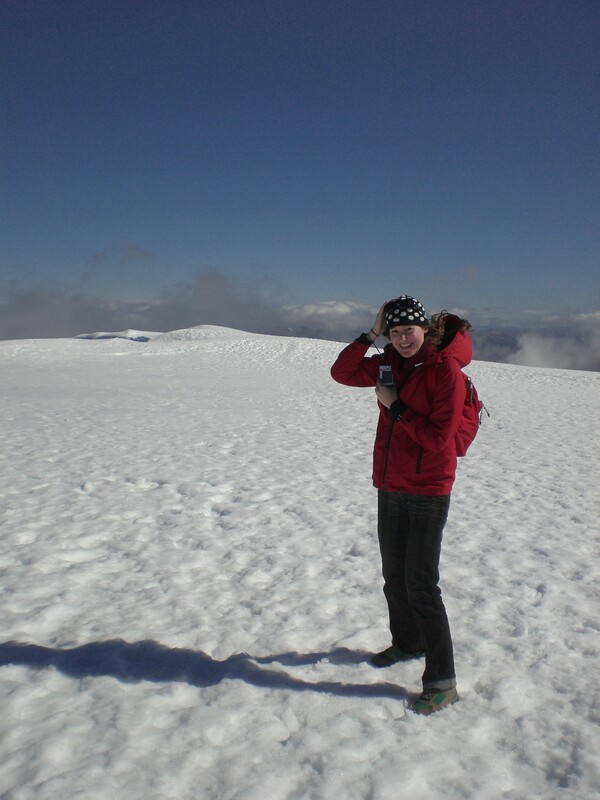 We thought it would be cool to hike Ben Nevis, the 4,409-foot highest peak in the British Isles. We figured it would be a bit of a trek, but we enjoy hiking, and Scotland’s not Nepal, right? 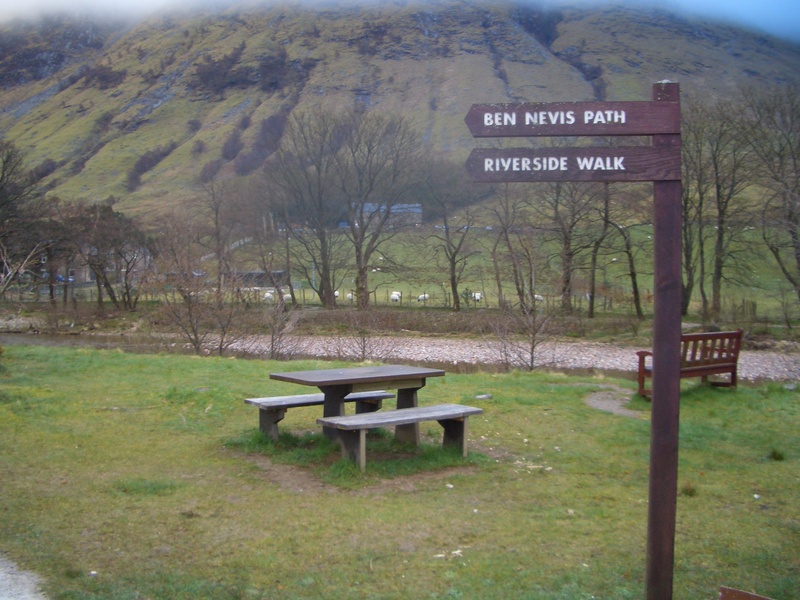 Without doing any real research, I learned Ben Nevis is the most popular Munro—the elite club of Scottish peaks higher than 3,000 feet—and attracts a wide variety of goers. 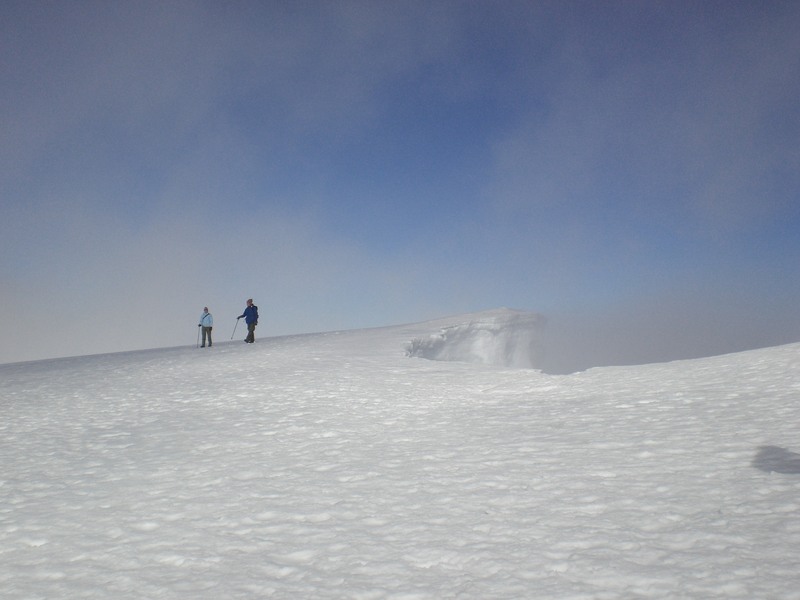 One website claims the round trip takes five hours for experienced “Munro baggers.” (A “Munro” is any summit in Scotland that’s over is a summit over 3,000 feet, or 914.4 meters.) That’s about eight hours for the rest of us. Our solution? Leave early in the morning and take our time. I read somewhere that it could be dangerous, but so long as we stuck to the trail, I figured we’d survive. That was supposed to be a figure of speech. We checked into a hikers’ hostel in the nearby town of Fort William, where a staff member took one look at us and handed us a Ben Nevis survival pamphlet. We barely skimmed it, figuring this was just one of those overly cautious things they had to do to avoid being sued. But this was Scotland, not the U.S., and even though you don’t need oxygen tanks or belaying experience to reach the summit, its seeming mild nature and the cliffs on three sides are what make the Beinn Nibheis, or “Venomous Mountain,” so dangerous. On a brisk April morning, we set out at 8 a.m. in jeans, tennis shoes (her), and cheap hiking boots (me). We enjoyed the scenery and the gradual climb. Grazing sheep probably laughed at our huffing and puffing. Other hikers all seemed to have maps and serious mountain gear, and as we ascended higher, we began to have doubts. Very few trees dotted the scrubby brown landscape—an enormous change from the lush Appalachians I knew from home. Above our heads, the overcast sky hid the peak from view. After a lunch of sandwiches, we had one banana left and less than a bottle of water. We entered the cloud, and as the valley below vanished, our world narrowed to an unstable path of rocks winding around the mountainside. To our surprise, we started seeing patches of snow. It went from being a novelty to a nuisance to an expanse of white with nothing to mark the trail but a row of footprints. At that point, the safe, smart choice would have been to turn back, but we had been hiking for four hours and I wanted my view. We pressed on. Until the footprints scattered—and with them, our path. Black rocks dotted the precipitous slope ahead. In the distance, gray fog and snow merged. Those cliffs had to be nearby. Some people with spiked trekking poles climbed straight up the steep hillside, while others walked to the right. But which was the safest route for two inexperienced hikers in jeans and tennis shoes? Our careless pride had gotten us in this situation, but it certainly wasn’t going to get us out of it. I tucked my proverbial tail between my legs and asked a friendly caravan of Irish hikers which way we should go. These angels in insulated pants didn’t just point the way—they shared their trekking poles and welcomed us into their group. Of course they went straight up the incline, so with the help of the poles, we jammed our toes into the crusty surface and kept up the best we could. The sharp wind drowned our voices. Bits of sky flashed through the wisps of clouds. Then my heart beat hard as a low stone structure emerged through the distant fog. The summit! We’d made it! Our mouths hanging open, we raced across the snow, fumbling in our coat pockets for our cameras. The cloud rushed overhead, unfurling the vista in maddeningly brief glimpses. We laughed with our heads tilted back, drinking in the day’s first blue sky until—at last—the fog cleared the summit and completely rolled away. Thanks to our saviors of the day, we were granted grace to make it to the top. 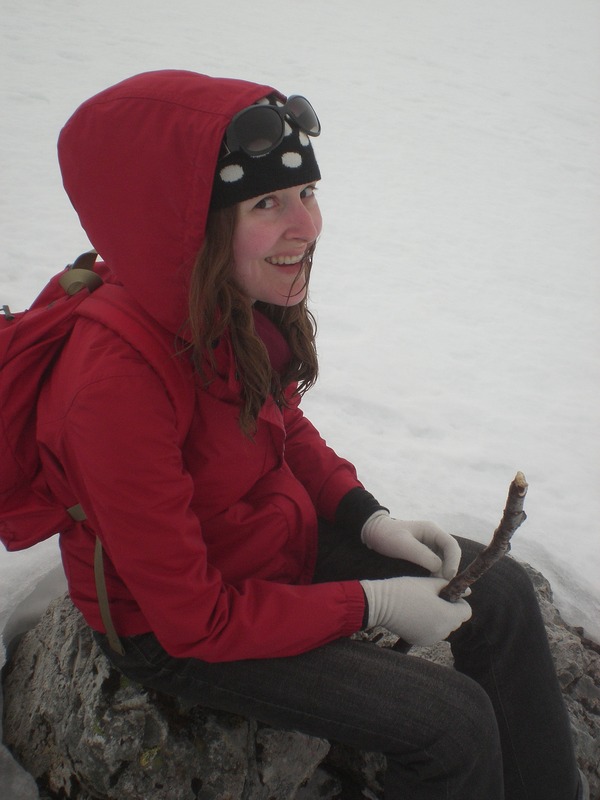 I don’t regret hiking Ben Nevis, but I do regret treating it like a Sunday afternoon hike. With the wealth of information at our fingertips, we had no excuse for going into an unfamiliar situation without doing proper research. Never again will I assume that warnings are just lawsuit avoidance and that I—in all my lofty self-reliance—can handle anything on my own. But I’ll still get out there, to see God’s creation in all its varied splendor, because for the rest of my life I will see those majestic glens and ridges of Scotland laid bare before my eyes. I will remember the feeling that followed, when the field of white poured across the sky below the peak, leaving me uncovered, higher than the clouds, higher than the other mountaintops jutting through the mist. Forget Everest or McKinley—I was on top of the world. And I was newly thankful for the grace to survive a hike by the unprepared. BIO: Michelle D. Sinclair is an account executive in the advertising department of The Washington Post and attends Northern Virginia Mennonite Church. She also writes monthly movie reviews for Third Way Café’s (website) Media Matters, as well as guest columns for the Another Way newspaper column. In her spare time, she enjoys writing young adult novels, spending time with her husband Brian, and playing with their cat, Josie.